Bathrooms, just like any other part of your home, wear and age with time. Regular usage causes them to lose their sheen or original aesthetic appeal. And at times, the design, layout and fixtures become outdated. A contemporary and smart makeover is then needed to the rescue and transform even the dingiest of bathrooms magically. In the German city of Krefeld, we came across one such bathroom which lay a shabby and boring affair in urgent need of an update. But thanks to the innovation of the interior architects at Innenarchitekturburo Jurgen Lubcke, the renovated bathroom is a bright and chic space in which every nook is brilliantly utilised. Read on to find out more about the makeover! 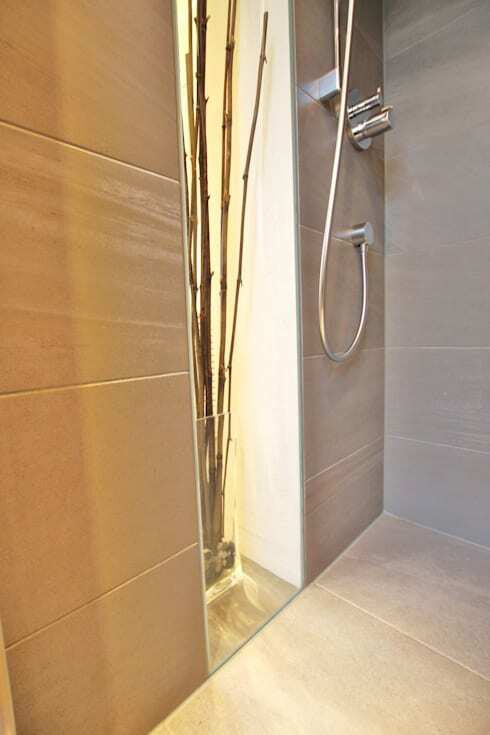 The brown tiles on the floor, walls and around the tub made the bathroom appear cramped and dingy. The tub took up an unnecessary amount of space and hindered easy movement here. The shelves just adjacent to the outdated shower cubicle were cluttered with baskets and toiletries, looking ready to spill at any time. The fixtures needed an upgrade too. 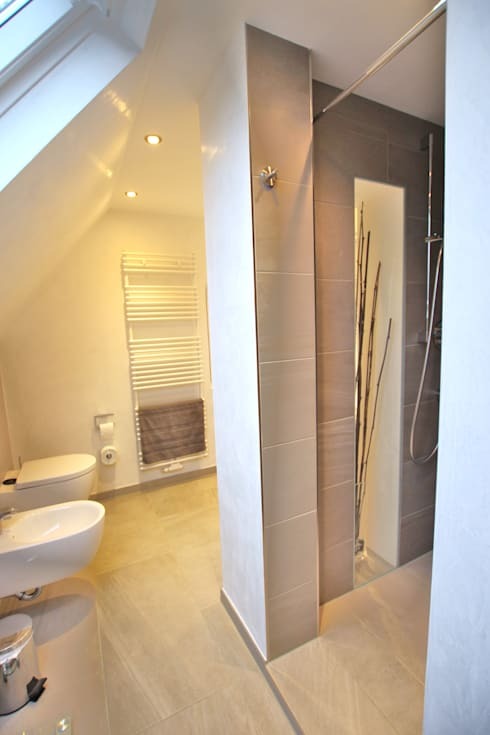 The bulky tub was removed during the renovation, and the bathroom was lined with large elegant pale grey tiles for a brighter and more spacious look. Chic fittings and warmly glowing recessed lights add to the rejuvenating aura here, while the changed layout offers more room to move about easily. The sink area has been creatively separated from the shower nook by a wall with a sleek aperture, adorned with a vase holding decorative branches. Bold blue lighting adds a dash of jazz here too. The slim sink is highly fashionable and comes with a glossy cabinet to store all odds and ends. The mirror cabinet is a useful addition too, to keep clutter at bay. 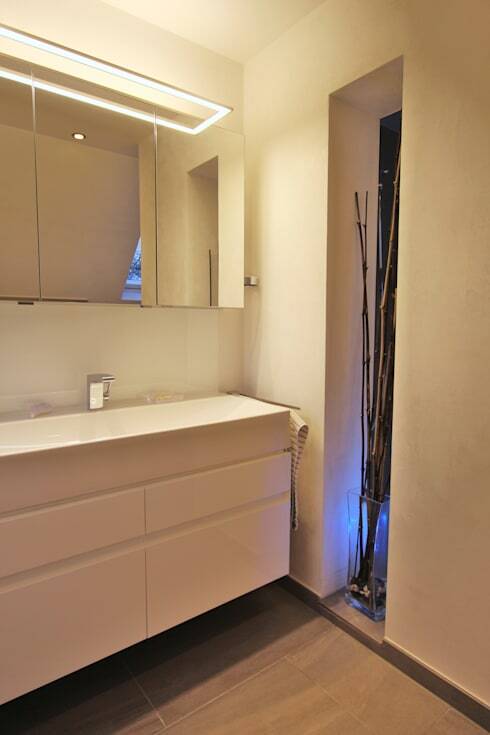 And the smart strip of light above the mirror lends pizzazz to the bathroom. The shower area with its smooth grey tiles is a snazzy and modern affair, where minimalistic fixtures cater to daily rejuvenation needs. The interior architects evidently followed the mantra of elegant simplicity. So you see how a clever change in layout, elimination of unnecessary elements, the introduction of light and bright hues and chic fixtures can drastically change the look of an old bathroom. Here is another makeover story that might inspire you too: From nightmare to dream home: an incredible makeover. Has this bathroom makeover given you some ideas for your own home?